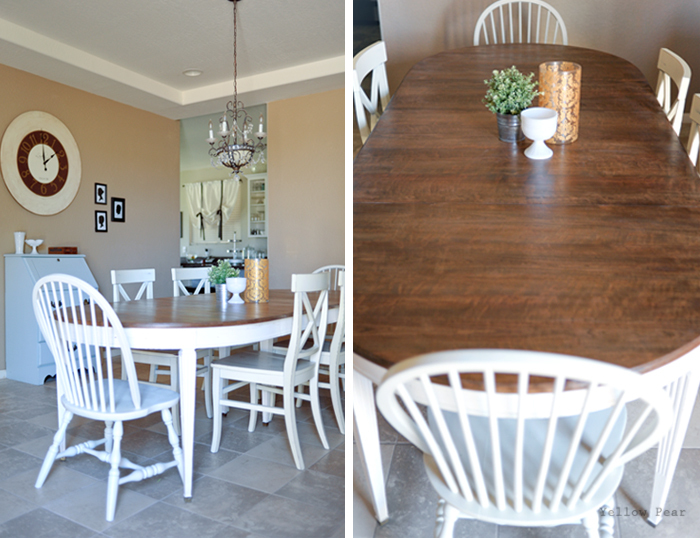 I recently refinished my dining room table. I bought it a few years ago from a garage sale. It's massive and I love the oval shape of the table and the square, tapered legs. 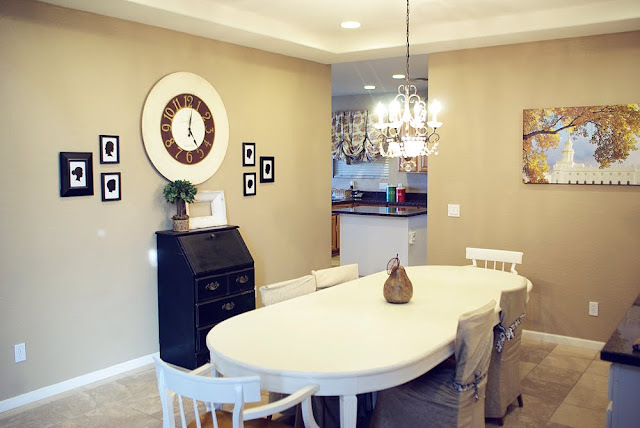 When we first moved into the house, I painted the entire thing white. And then I was on the hunt for mismatched chairs. I finally gathered six suitable ones after some focused thrifting and then painted them all a neutral grey. I was quite happy with the outcome for quite awhile, but the tabletop had crackled some when I had painted it and wasn't holding up well. Especially because a certain little tyke loved to do art projects on the table and there were always marker/paint/pencil/crayon marks smeared across it. One day I got tired of it, decided I was ready for a change, and ran to the store for supplies. I wanted to strip the table top and stain it, leaving the legs white. I thought it would add a bit of warmth to the room. 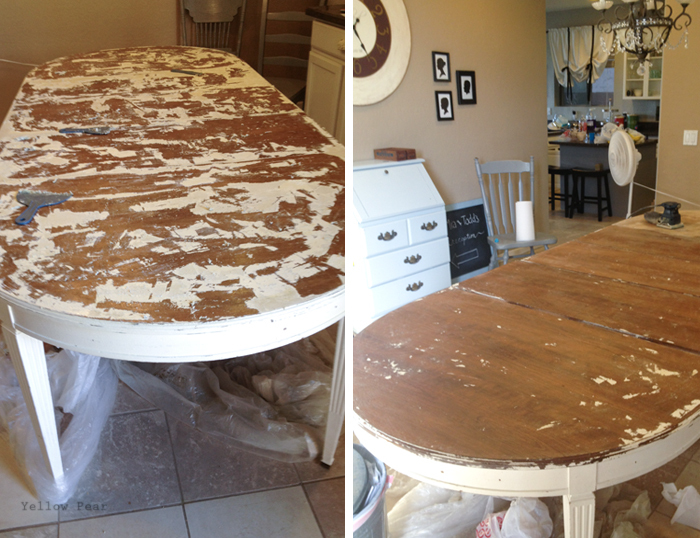 I decided I would refinish the table indoors because it is huuuuge and heavy. The weather was beautiful so I opened all of the doors and windows on the main floor and plugged in a few fans for some nice air circulation/ventilation. I also threw a piece of plastic under the table and on the floor. I wasn't too worried about the tile though. Next I applied Paint Stripper to the table top only and followed the directions. I bought the low fume version as I was indoors. Then I let the paint bubble off and scraped it away (using my heavy duty gloves). It took a few coats and I finally realized that things moved much quicker when I applied large quantities of the Stripper to the paint. I ended up running to the store for more. This was the hardest part by far. Stripping the paint took a lot of elbow grease and patience. The detail around the edge of the table was definitely time-consuming and stress-inducing. I found that steel wool, mineral spirits and a toothpick worked wonders (along with a lot of deep breaths and self-motivation). Once the back-breaking-paint-removal portion (and cleanup) was finished, I moved on to sanding. I made sure to sand every last bit of paint off, plus the old varnish underneath to reveal the raw wood. Then I wiped everything down really well to remove any loose sawdust. 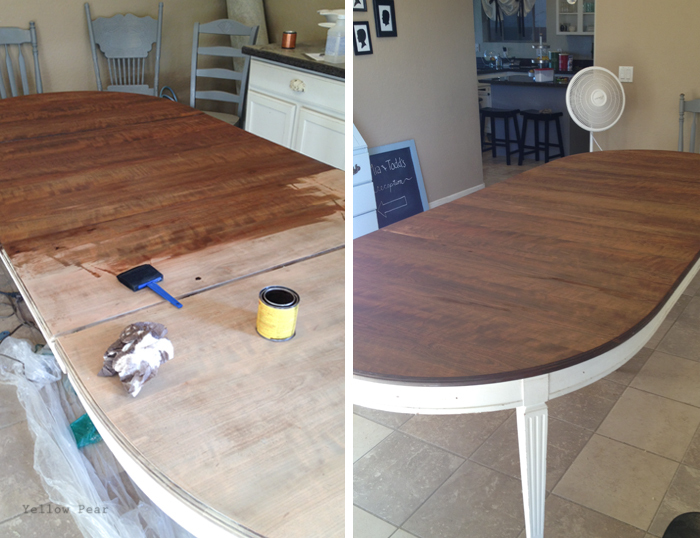 I then stained the top with Minwax Special Walnut and applied a Satin Polyurethane to protect the finish. I didn't want a thick, heavy gloss...just a touch of sheen. I also think a finishing wax would have worked as well. After that, my mismatched grey chairs did NOT look right. So that meant I needed new chairs. Ha. I scoured Craigslist for chairs and finally found four X-back Ballard Design chairs for a great deal. 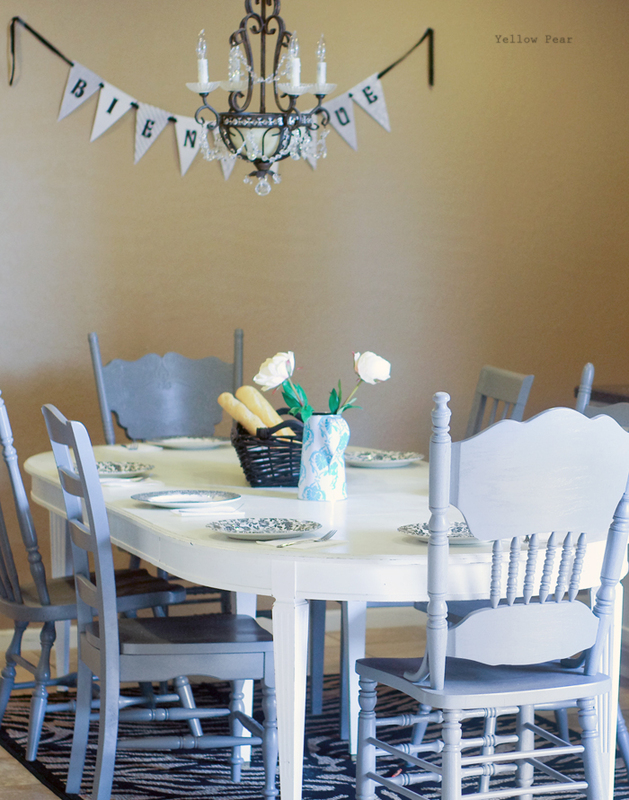 They were already a beautiful cream and in perfect condition, so I repainted two chairs from the kitchen cream for the ends and my table (and my dream) was complete. Although I still need to touch up the table legs. It's never ending. I just love how furniture/homes and decor are always evolving to fit needs, styles or life-changes. It keeps things interesting. That looks great! I need you to come do my table next, I also have a white table with so many marker, crayon marks on it, it desperately needs to be redone. Looks awesome! I love the X back chairs too! Good job! I don't like reading your blog. It reminds me of everything were missing out on together....I'll never be happy will I?